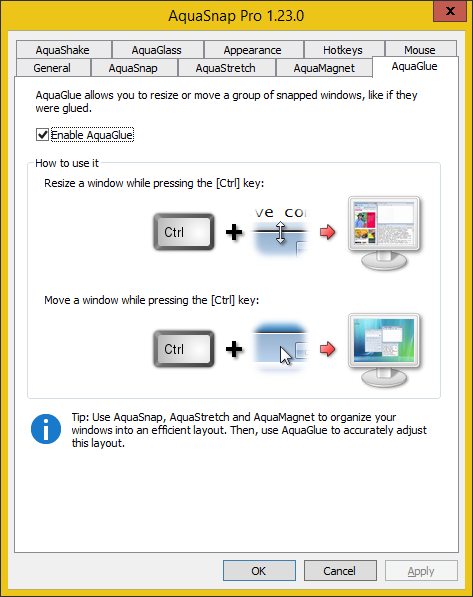 Here you can configure the AquaGlue function of AquaSnap. To access this screen, double-click on the tray icon, at the bottom-right corner of the screen, and click on AquaGlue. Enable AquaGlue: when enabled, the AquaGlue function is active. You can move or resize a group of adjacent windows by holding the Ctrl key while moving or resizing one of the windows. The default value is enabled. How to use it: here is an explanatory picture summarizing how AquaGlue works.